I have a Master Casters set for the 1/32 Haegawa Ju 87D. It comes with resin exhausts and the clipped VS-111 propeller blades. I've seen photos of both styles of blades in photos but can't seem to come up with any hard, fast rules on which D models it was used on. Standard propeller for the the Jumo 211 F & J motors was the VS-11. 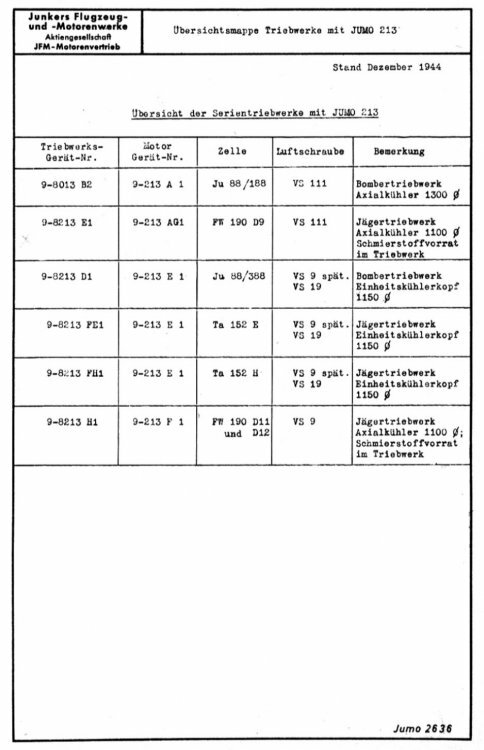 You would need the Ju87 D-3 Handbuch to confirm the specific 9-2xxxx blade number. The VS-111 was a later blade for the Jumo 213, fitted mostly to Ju88 variants and D-9's. Thanks, Steve! After reading some reviews apparently the blades in the kit are not correct, the Master Casters set I have appear to be a little more accurate so I'll go with those. Late D-3 from the 131001 and subsequent Werknummern block introduced the VS 111 propellers. Nevertheless, you'll also find photographs of later D-7 models with the earlier clipped VS 11 blades.